Do you want more info about Citrasate® dialysate Acid concentrate sent to you? 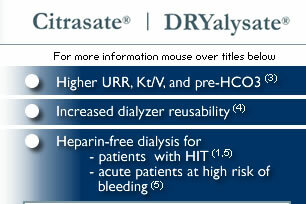 Citrasate® is acid concentrate for bicarbonate-based dialysis solution. Citric acid instead of acetic acid is the primary acidifying agent. DRYalysate® is a similar product in powder form. Even though the amount of citrate used is very small, the 2.4 mEq/L citrate in the final dialysate may inhibit blood coagulation locally at the dialyzer membrane surface, resulting in better dialyzer clearance and increased reusability. Heparin use is still recommended, although heparin-free dialysis with Citrasate® has been reported to give good results with less need for periodic saline flushing. Advanced Renal Technologies provides an advanced dialysis fluid (dialysate) formulation containing citric acid--the first major change in dialysate chemical composition in 25 years. reduces dialyzer clotting and increases dialyzer reuse, saving clinics time and money. Stated conclusion: "Using dialysate containing citric instead of acetic acid increases the delivered dialysis dose." Ahmad S, Callan R, Cole JJ, Blagg CR. Dialysate made from dry chemicals using citric acid increases dialysis dose. Am J Kidney Dis. 35(3):493-499, 2000.